Conor Hourihane and Glenn Whelan both started, while Scott Hogan was introduced off the bench. 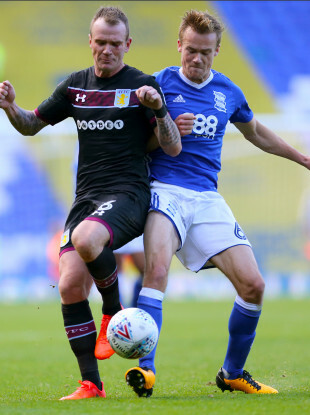 Aston Villa's Glenn Whelan (left) and Birmingham City's Maikel Kieftenbeld battle for the ball. ASTON VILLA REMAIN sixth in the Championship table after a 0-0 derby draw with Birmingham City at St Andrew’s on Sunday. Irish internationals Glenn Whelan and Conor Hourihane both started for Villa, while Scott Hogan — who also features in the squad for the Boys in Green’s upcoming games against Denmark — was introduced as an 81st-minute substitute. None of the three players in question could make a difference on the scoresheet, however, as the Villains had to settle for a point against their bitter rivals. Jota missed a clear chance for the home side while Keinan Davis rattled the underside of the crossbar, but there was ultimately nothing to choose between the West Midlands foes as Steve Bruce’s side made it a club-record 11 consecutive matches against their cross-city rivals without defeat. There was little between the sides in an uneventful first half but Birmingham should have taken the lead just three minutes after the break, with Jota intercepting Hourihane’s pass and racing clear into the penalty area, only to blaze a shot over the bar. The best remaining opportunities fell to Villa, though, with Jonathan Kodjia’s header forcing an athletic save from Tomasz Kuszczak before Mile Jedinak nodded another chance wide. Birmingham had the woodwork to thank for preserving their point in the closing stages. Davis blasted a shot off the bottom of the bar and out after Kuszczak had saved at the feet of Alan Hutton, before Kodija cut infield from the left and clipped the frame of the goal with a dipping strike. In the end, however, there was to be no breakthrough, meaning Villa stay sixth in the table, although they are now level on 23 points with fifth-place Leeds United. Birmingham are only two points above the bottom three. Email “No joy for Irish trio as one of English football's biggest derbies ends goalless”. Feedback on “No joy for Irish trio as one of English football's biggest derbies ends goalless”.